1.9 How to Apply for NABARD Recruitment 2017 online? NABARD Recruitment 2017: The Latest NABARD Jobs are available here. The National Bank for Agriculture and Rural Development releases various notifications every year. So, the aspirants who dream to get a Bank job can get complete information about NABARD Careers here. 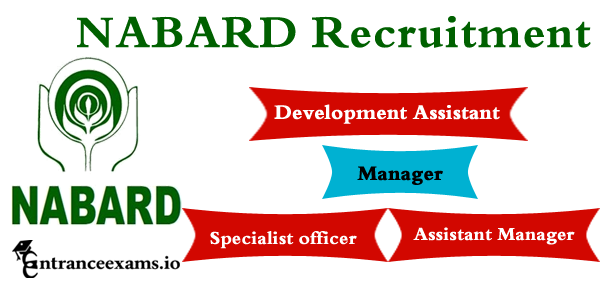 We have provided the list of Latest Nabard Bank Job openings here. Hence, go through the following sections of this article to know more about NABARD Vacancy, NABARD Development Assistant Online Application, Eligibility, NABARD Syllabus, Previous Papers, etc. Bank jobs are being more popular with time, as they have flexible working hours, and the salary is impressive too. Also, most of the candidates wish to get a job in Banks because of its advanced facilities. We all know that there will be a huge competition for the Bank jobs in India. So, in order to crack the exam, we insist all the candidates prepare well for the exam by following the given guidelines and also apply only if you think you are eligible for that particular position. Here we have given the list of forthcoming NABARD Notifications in the year 2017-2018. Hence, the aspirants who wish to make their career in NABARD Bank can bookmark this page to get the live and latest updates about the Upcoming NABARD Jobs 2017-18. The NABARD (National Bank for Agriculture and Rural Development) Bank is set up as an apex Development Bank. The bank was started for facilitating credit flow for promotion and development of agriculture, cottage and village industries, small-scale industries, handicrafts, and other rural crafts. It also has the mandate to support all other allied economic activities in rural areas, promote integrated and sustainable rural development and secure prosperity of rural areas. The bank recruits the eligible candidates for the low-level positions through personal interview alone. Other positions are filled by students from varying disciples like engineering, science, computer science, diploma holders, post graduates, graduates and so on. Whereas for the manager and assistant manager positions, the candidates have to take up NABARD examination specified for the position. The written exam is of descriptive type which contains questions related to General English and an objective type paper which contains questions related to computer awareness, reasoning, and general awareness. Here is a good news for the candidates who were looking for Bank Jobs. NABARD Bank has recently released a notification for filling the vacancies of Manager and Assistant Manager posts in Grade A & Grade B. There is a total of 117 vacancies available for the post of Assistant Manager in NABARD. The online application submission for NABARD Recruitment 2017 has already started, i.e., from 16th June. The online application link of these NABARD Grade B jobs will be disabled from its official website, so you are advised to apply as soon as possible until the last date, i.e. 12th July 2017. Aspirants can also download the NABARD Manager Grade A & B Notification 2017 in the pdf format below. Here on this page, we are providing the post wise vacancy, Age Limit, Age relaxations, qualifications required, etc. of NABARD Assistant Manager Recruitment 2017. The Eligibility criteria of NABARD Manager Recruitment 2017 specify the age limit, educational qualification, and nationality of the candidates. So, before applying for this notification, one should read the eligibility criteria of NABARD Manager Grade B Recruitment 2017 thoroughly to know whether they are eligible or not. Applicants of NABARD Recruitment 2017-18 should have completed their Graduation/ Post Graduation Degree with good marks from a well known/ recognized University. The postulants should be aware of some details regarding NABARD Manager Recruitment 2017 such as Selection Procedure, Application Fee, Pay Scale, etc. For your convenience, I have given all those details in the below sections. Aspirants of NABARD Recruitment 2017 will be selected based on their performance in the following rounds. Aspirants applying for NABARD Manager Exam 2017 need to pay the application fee in online mode along with transaction charges. The application fee for various categories is given in the table below. All the selected candidates of NABARD Grade A & B Manager Recruitment 2017 will get a pay scale as per the norms of the organization. But the scale of pay varies for each grade. So, I have given the salary separately for each grade. Manager: Rs.35,150 to Rs.50,900/- per month with a Grade Pay of Rs. 1,750/-. Assistant Manager: Rs.54,400 to Rs.62,400/- per month with a Grade Pay of Rs.2,000/-. How to Apply for NABARD Recruitment 2017 online? Firstly, visit the official website of NABARD Bank, i.e., www.nabard.org or direct link given below. Click on Latest Job Openings available on the homepage. Now search for the relevant NABARD Notification which you wish to apply. Read the notification thoroughly before applying. Click on NABARD Apply Online link for the relevant post available below. Now navigate to Click here for New Registration and complete the basic registration process. On submitting, a unique registration number and password will be sent to your registered mail id and phone number. Now login with those credentials and fill the details in the relevant fields. Make fee payment as per your category in online mode. Upload scanned copies of recent passport size photograph and signature as per the given format. Verify all the details and click on Submit button. Finally, take a printout of the application form for future use. Stay tuned with our www.entranceexams.io site for more updates about Upcoming NABARD Notifications 2017-18. If you have any queries regarding this NABARD Recruitment 2017, then leave them in the comment section below.